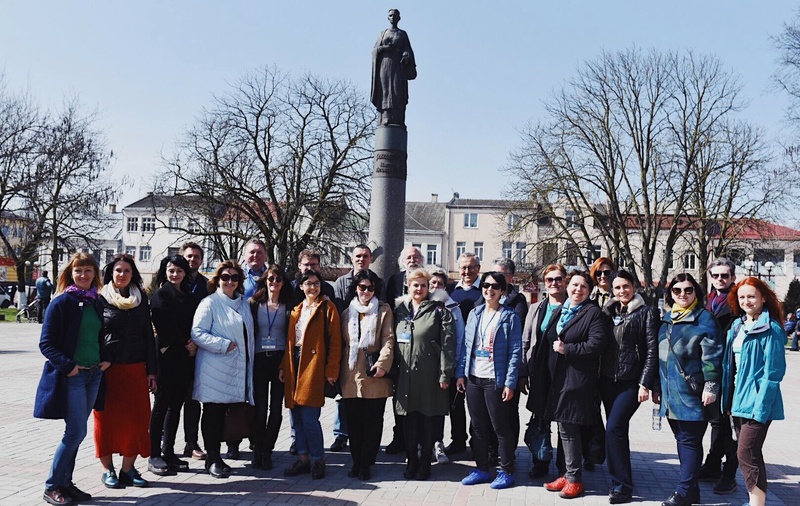 This week we participated in a conference on “Civil Society, Digital Storytelling and 20th Century Jewish History in Ukraine“, and led a tour of heritage sites in Rohatyn for about 25 educators from Ukraine, Moldova, Germany and Poland. In the historical Jewish quarter of Rohatyn. Photo © 2018 Jay Osborn. The three-day conference was hosted and managed by Vienna-based Centropa though their Trans.History education program for teachers and civil society activists in Ukraine and Moldova, in partnership with their NGO partners: the Society Initiatives Institute (Lviv, Ukraine), Mnemonika (Rivne, Ukraine), the International Center of Training and Professional Development (Chișinău, Moldova), the Ukrainian Center for Holocaust Studies (Kyiv, Ukraine), and the Center for Urban History of East Central Europe (Lviv, Ukraine). The event brought together more than 50 participants from the four countries, who attended presentations and collaborated in workshops led by activists working with Jewish heritage in Ukraine and Moldova. We first attended a Trans.History seminar one year ago, but this week we were full participants for the entire event and led a large portion of the exploratory segment of the conference. One of the student presenters for the exhibition. Photo © 2018 Marla Raucher Osborn. The main conference venue was the historic George Hotel in Lviv. A number of rooms were set aside for lectures to the group and for smaller hands-on workshops. The George Hotel also graciously dedicated its lovely restaurant space on the ground floor for presentation of Centropa’s large traveling exhibition “The Ukrainian Jewish Family Album“, which was presented by six high school students from Lyceum “Oriyana” in Lviv under the guidance of Centropa-trained teacher Olena Sakhno; the students presented and explained the panel exposition, highlighting interesting details from each of the panels. Fabian introducing conference partners and leaders. Photo © 2018 Marla Raucher Osborn. The conference opened with a welcome from Centropa’s Trans.History lead Fabian Rühle, who introduced partners and supporters of this year’s conference as well as his team of organizers and the itinerary for the three days. Fabian was followed by a solemn and moving speech by Andrea Stohr, a representative of the Department for Culture, Education, and Minorities at the Germany Embassy in Kyiv, who acknowledged Germany as perpetrator of “the most heinous crime in human history”, and emphasized that this responsibility puts Germany today in the unique position and obligation to support projects recovering and strengthening Jewish history in central and eastern Europe, Holocaust remembrance, and fighting antisemitism everywhere. 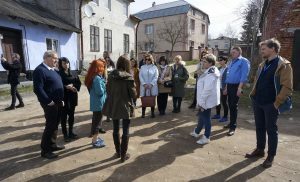 She noted that to date, Germany’s foreign ministry office has funded and supported 650 civil society projects in central and eastern Europe. A session in the “marketplace of ideas”. Photo © 2018 Marla Raucher Osborn. Following an “ice-breaking” activity in which participants learned more about each other and their individual interests and teaching activities, the Centropa program and materials were outlined as tools and resources for education development, with particular focus on elements relevant and useful to teachers in Ukraine, Moldova, and Germany. As one example, Centropa’s unique short film “Return to Rivne” (2015) was presented. The several teachers who are experienced in the use of Centropa’s tools in their classrooms contributed to an informal “marketplace of ideas”, in which participants could wander between conference rooms to see and hear short but stimulating examples – three of which won awards presented at the conclusion of the conference. A difficult discussion at the south mass grave in Rohatyn. Photo © 2018 Jay Osborn. Professor Anatoly Podolsky of the Ukrainian Center for Holocaust Studies then gave an animated lecture to the assembled group on 20th-century Ukrainian-Jewish history and the Holocaust, after which participants viewed the “The Ukrainian Jewish Family Album” and concluded the day with a dinner together at the George Hotel. Marla speaking to the tour group at Rohatyn’s new Jewish cemetery. Photo © 2018 Jay Osborn. 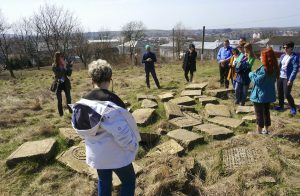 On the second day of the conference, researcher and guide Alex Denysenko led a tour of historic Jewish sites in Brody and Busk, and Rohatyn Jewish Heritage led a tour around sites in Rohatyn. Among the places we visited in Rohatyn were the two Jewish cemeteries, the south mass grave from the March 20, 1942 aktion, and the historic Jewish quarter along vul. Valova where at least four synagogues and a Beit Midrash once stood. 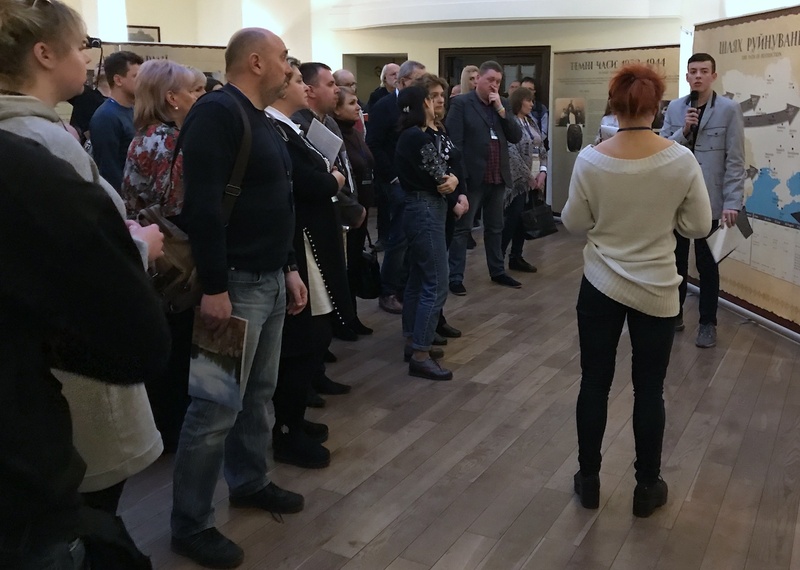 The tour of Rohatyn lasted four hours, including a visit inside Rohatyn’s 17th-century wooden Holy Spirit church, a site inscribed on UNESCO’s World Heritage List since 2013. Throughout this tour (and on all days of the conference), English- and Ukrainian-speaking participants were aided by our friend and interpreter Olha Tyshkovets, who has served many of the Jewish heritage events in and around Lviv for years. 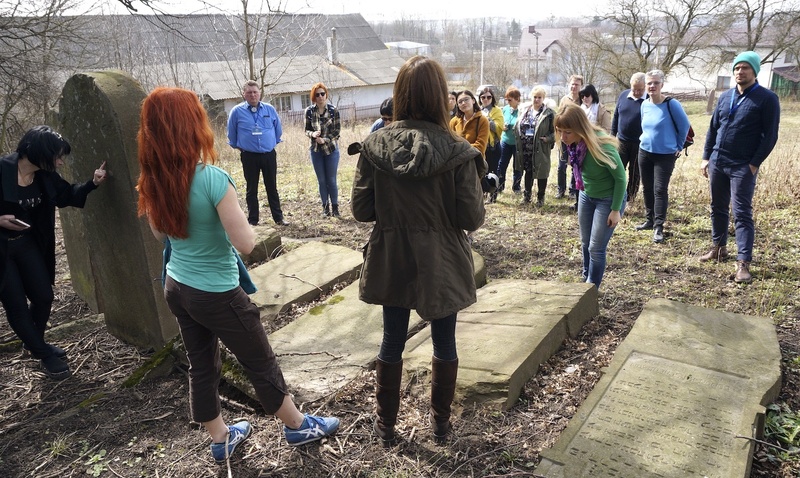 Following our return to Lviv, participants were then treated to a tour of Jewish sites in the city by Alex Denysenko. At Rohatyn’s old Jewish cemetery. Photo © 2018 Jay Osborn. On the third day, participants selected from a variety of four-hour workshops conducted by activists in Jewish heritage and memory projects, on the use of student photography projects as a teaching aid, social media techniques to integrate history and civic activities, digital tools for finding lost history inside and outside the classroom, commemoration methods for Jewish life and Holocaust studies, and hands-on heritage preservation and restoration projects as a means to revitalize hidden history. 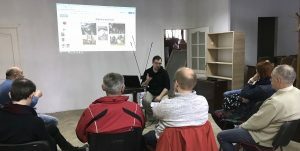 Among the workshop leaders was our friend and colleague Christian Herrmann, who has been photographing Jewish sites of heritage in Galicia, Bukovina, and beyond for years, and with whom we travel often in the region. 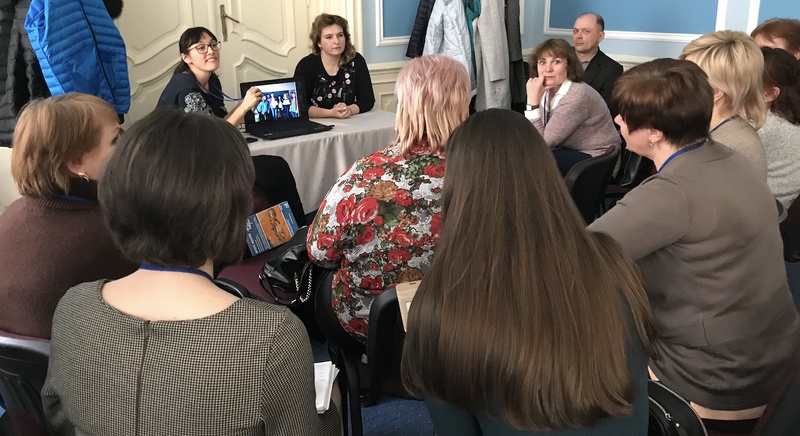 During Christian’s workshop, skilled simultaneous English-Ukrainian interpreting was provided by our friend and RJH website translator Svitlana Bregman. Five views of the photography workshop led by Christian Herrmann. Photos © 2018 Jay Osborn. Sasha Nazar leads a heritage workshop in the historic Glanzer synagogue. Another workshop leader was Sasha Nazar of the Lviv Volunteer Center of All-Ukrainian Jewish Charitable Foundation Hesed-Arieh, project lead for the ongoing rehabilitation of the Jacob Glanzer synagogue here in Lviv, and activist at several other heritage sites in the Lviv Oblast. 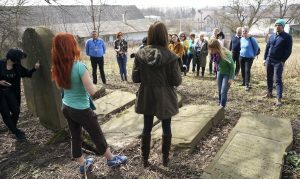 We joined the Lviv Volunteer Center twice last summer when they led clearing actions in Rohatyn’s new Jewish cemetery, and again for several days of work camps organized at the Jewish cemetery and synagogue in Staryi Sambir and the Jewish mass grave in nearby Ralivka. We hope to assist the LVC again this summer working at other heritage sites in the Lviv Oblast. 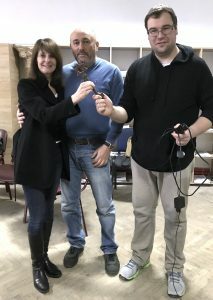 Marla with friends and heritage workers Hrihoriy and Sasha at the conference. Photo by Arie Lisakoff for the LVC. The conference gave us a welcome opportunity to visit and renew connections with many long-time friends and partners; it was also both amusing and heart-warming to meet others for the first time who we have been following online from afar for years. We are very thankful for the interest in our heritage and history program shown by so many of the conference participants, and we are especially appreciative for the valuable comments and suggestions we received from old and new friends including Christian and Sasha as noted above but also Max von Schoeler and Magdalena Farnesi of Centropa Germany; Emil Majuk of Shtetl Routes and Rootka based in Lublin, Poland; teachers Nataliya Porokhnyak and Kateryna Tsybulska of Ternopil, Ukraine; Jewish history and heritage dynamo Irina Shikhova of Chișinău, Moldova; and German educators Gottfried Becker, Kirstin Lakeberg, and Sabine Kreutzer. 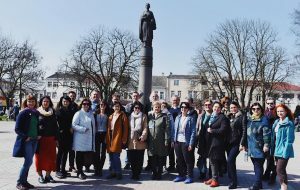 The tour group at Rohatyn’s Roxelana Square. Photo by Taras Kovalchuk for Centropa. 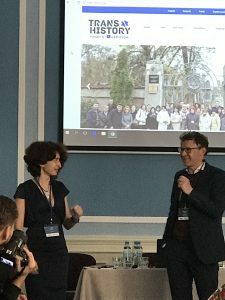 That most of these people are also frequent participants in Centropa conferences and leaders of Centropa-inspired education projects is further evidence of their long-term commitment to integrating Jewish history and heritage in the development of citizens and civil society in their own local areas and well beyond. Rohatyn Jewish Heritage is grateful to our good friend Fabian Rühle for this year’s invitation, for the opportunity to share our work in Rohatyn with educators, and for another successful “teaching-the-teachers” conference. We hope to join again next year, when Centropa and the Trans.History program come to Odesa. Update: A description of the seminar and a nice selection of photographs from the days now appears in Centropa’s Trans-History Project Report 2017-2018; look for the article starting on page 39, and for a photo of the workshop tour in Rohatyn on the cover!